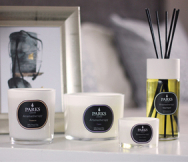 Refreshing, uplifting and enlivening, Sicilian bergamot combines with fragrant rosemary and precious balsam woods in this 3 Tots Luxury Fragranced Candle Gift Set. Captured in the purest natural wax, these tot-sized Rosemary & Bergamot candles have the power to transform your home with their captivating blend of fine scents. The bergamot scent is derived from the bergamot orange, a small citrus fruit that is grown in Calabria in southern Italy. This fruit, which is not unlike a lime in appearance, produces a rich and slightly spiced citrus aroma that has been used in perfumery since the 18th century, owing to its ability to form pleasing fragrances when added to other scents. Taking scents of bergamot, our skilled perfumers have lovingly combined it with fragrant rosemary to create a unique home blend. To this pleasing medley, a host of delicate balsamic and woody aromas has also been added for a refined and satisfying fragrance that's reminiscent of high-end cologne and perfume. This fragrant grouping of rosemary, bergamot and balsam woods is one of the signature scents in our exclusive Aromatherapy collection, which features classic scents that promote peace, tranquillity and well-being in your living space. Burn these wonderful tot-sized candles in your home and sink into an intoxicating fragrance blend that's enriching and reviving. The Rosemary & Bergamot 3 Tots Candle Gift Set is designed to give you the freedom to introduce fine scent into every room of your home, so that you can enjoy these enriching fragrances throughout your living space. And with a combined burn time of 60 hours, you can enjoy long-lasting and true-to-life fragrance from the first to last use.